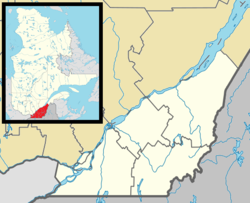 Thetford Mines (Canada 2011 Census population 25,709) is a city in south-central Quebec, Canada. It is the seat of Les Appalaches Regional County Municipality. Thetford Mines was founded in 1876 after the discovery of large asbestos deposits in the area, and the city became a hub for one of the world's largest asbestos-producing regions. 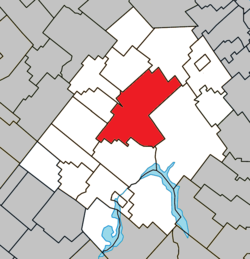 In 2001 the city expanded to its current boundaries, merging with Black Lake, Robertsonville, Pontbriand and Thetford-Sud. Thetford Mines is the seat of the judicial district of Frontenac. Köppen-Geiger climate classification system classifies its climate as humid continental (Dfb). Winters are very cold, rainy and snowy, while summers are warm and rainy when it receives more precipitation. Given the abundance of snow for several months in winter, it is a popular area for snowmobiling and four-wheel drive vehicles as well as for downhill and cross-country skiing. The city is home to the minor-pro ice hockey team the Thetford Mines Isothermic, who are members of the Ligue Nord-Américaine de Hockey (LNAH). They play home games at Centre Mario Gosselin. Thetford Mines is the only city to have hosted an LNAH team in every season since the league's 1996 inception. The city has ringette and hockey organisations for the youth, and there are yearly tournaments for ringette and minor Hockey players, as well as old-timers hockey tournaments. 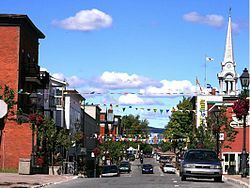 Thetford Mines was chosen as a top-five finalist for Kraft Hockeyville for 2009 on the February 21, 2009 Hockey Night In Canada "Hockey Day In Canada" special. Spring is maple syrup producing time in the area. The numerous stands of maple trees in the region makes it one of the top maple syrup producing regions in the world. In March and early April, local citizens often make a ritual outing to one of the area's sugar camps (or cabanes à sucre) for sugaring off parties where maple syrup, reduced and thickened by slow boiling, is poured over fresh snow to create a delightful taffy. Summer brings a host of other outdoor activities. An abundance of lakes and rivers provide plenty of opportunities for outdoor gatherings and cool refreshment. A series of summer festivals add to the enjoyment of the season, with sporting events, concerts and fireworks. The same maples that produce syrup in spring, provide brilliant displays of colour in autumn. Two radio stations, CFJO ("O97,3") and CKLD ("Passion-Rock 105,5") serve Thetford Mines. Both stations air programming produced partially in Thetford Mines and partially in Victoriaville. ^ a b "(Code 2431084) Census Profile". 2011 census. Statistics Canada. 2012. ^ a b Thetford Mines (Census agglomeration), Quebec 2011 Census Profile. The census agglomeration consists of Thetford Mines, Saint-Adrien-d'Irlande, Saint-Joseph-de-Coleraine. In the 2006 census, the census agglomeration had not included Saint-Joseph-de-Coleraine. ^ a b "Climate: Thetford Mines - Climate graph, Temperature graph, Climate table". Climate-Data.org. Retrieved 31 August 2013. Wikimedia Commons has media related to Thetford Mines.